The Thrivent Build. Courtesy of Habitat for Humanity Cabarrus County's Facebook page. Earlier this year, Habitat for Humanity Cabarrus County hired on a new Resource Development Director. 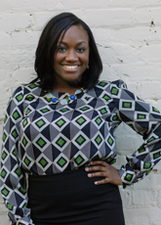 This community-oriented nonprofit welcomed Shanell Smaw with open arms, and we just had to get the inside scoop. With a passion for serving, Shanell was the perfect fit for this position. In a recent Habitat for Humanity Cabarrus blog post, her tenacity and faith was one of Shanell's most admirable qualities. We were able to get in touch with Shanell to learn a little bit more about her passions and goals, as well as her new role with Habitat for Humanity Cabarrus. Tell us a little about working for Habitat Cabarrus. How has it been so far? Working for Habitat Cabarrus has been great so far. The staff is wonderful and genuinely cares about the work they do. Everyone is helpful and it’s a really nice team environment. I’ve had the opportunity to meet some of the partner families and the weekday warriors, who volunteer their time weekly to help build and repair homes. The families are very grateful and the volunteers are amazing. They have a true passion for helping others. Tell us a little bit about your new role there. Have you always had a passion for helping others? My new role here is Resource Development Director, so basically I will be responsible for fundraising (events, grants, etc) and marketing, working with the fabulous Perry Productions staff. I’ve always had a passion for helping others. When I was very young, my grandmother was the Chaplain at a hospital and I would go with her to pray for the patients and I would sing to the elderly patients during their activity time. I think that’s where it all started for me. I loved how just a small gesture of kindness made a big difference in their lives. I joined the Make A Difference Club in middle school and we did various volunteer projects with that group. In college, I volunteered for Big Brothers Big Sisters and many other organizations through my sorority, Alpha Kappa Alpha, Sorority, Inc. After completing graduate school, I became involved with Urban Ministries of Wake County and volunteered through my church outreach ministry with Genesis Home, Raleigh Rescue Mission and Durham Habitat. My friends and I used to volunteer on Thanksgiving and Christmas at Durham Rescue Mission. I even created and hosted an event called “Coats, Cans & Cocktails,” a party that collected canned goods and winter clothing to donate to the Durham Rescue Mission. I really enjoy helping others because I know what it’s like to need help and I’ve been fortunate enough to have a great support system any time I was in need. I know that not everyone has that, so I try to do my best to be there for others. What are your goals for the yourself within Habitat Cabarrus and where do you see it heading? What sort of activities will you focus on? Right now my goals are to learn everything I can about the organization and determine the most creative ways to raise funds. I want great results, but I love to have fun so I will try to connect the two, where feasible. Long term, I would like to have each home fully funded prior to the groundbreaking ceremonies. Habitat Cabarrus has great supporters and strong relationships in the community, so I would like to build off that to increase the number of major donors in our database. I would also like to build more partnerships within the real estate community in Cabarrus County. What is your personal favorite aspect of the group and its mission? My personal favorite aspect of Habitat Cabarrus is that it is operated on Christian principles. This shows in every aspect of the organization’s operations. For example, the office has daily devotions where we take the time to read stories & scriptures and pray. In my previous fundraising job, I would always pray about my events and when they went well I’d proclaim “Look at God!” Here, that is the norm and I am not alone. The staff prays for the community and the partner families we serve. Everyone here seems to really be decent people who are concerned with the well-being of others. While everyone at Habitat Cabarrus is amazing, I don’t think I’ve met too many people as Christ-like as Executive Director, Dave Zablotny. You can just tell that his heart and intentions are pure. His calm, cautiously optimistic leadership sets the tone for the rest of the staff. Katie Page will be the new Executive Director as of April 1 and I really admire her can-do attitude and her honesty. She will continue to steer this organization in the right direction and I am proud to be under the leadership of both of these wonderful people. What's one of your most memorable moments (if you have any yet!) while working there so far? One of my most memorable moments so far was the groundbreaking ceremony for our 150th Home. This home is for a mother and her teenage daughter and is also our Collegiate Challenge build, which will host students from Waynesburg and Stockton Universities as volunteers for two weeks. The ceremony was attended by Habitat staff, and family and friends of the homeowner. There was prayer, scriptures and the family decided to put Bibles in the ground before the foundation was laid as a symbol of God’s word as the foundation of their new home. I was so moved and honored to be part of this experience. I am amazed that Habitat Cabarrus has been able to build 150 homes in less than 30 years as well as complete home repairs and weatherization projects and provide transitional housing for almost 1,000 people. Right now I am looking forward to the St. Patrick’s Day Party on March 18th at Great Wolf Lodge. This is the first event I’m working on, so I am looking forward to seeing the results. Everyone has been so helpful and there is definitely a team approach to planning this huge event. There will be a plated dinner, dancing, music, a photo booth, silent & live auctions and raffles. So, everyone reading this article should make plans to attend the party! I am also looking forward to attending my first home dedication. I am excited to see a family get ready to move into their new home. 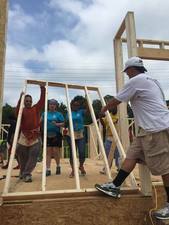 Anything else we should know about Habitat Cabarrus and how people can get involved? I am very grateful for the opportunity to work for such a worthy cause. I’ve prayed to be able to love what I do and to make a difference in the lives of others. Fundraising is a tough job, but the challenges are so much easier when you realize that what you’re doing is for the greater good of humanity. People should also know that the families served by Habitat Cabarrus are not given a hand out. Partner families must complete 250 hours of volunteer work (called sweat equity) that includes homeownership and financial literacy classes. This means that they help build homes for other families in the program before construction can begin on their home. Families also pay a zero interest mortgage on their homes. For those families who receive critical repairs such as new roofs and wheel chair ramps, they are required to pay back a small percentage of the cost of the repairs to help sustain the home repair program. Everyone in our program is striving to make a better life for themselves and their children, Habitat Cabarrus is there to lend a hand up to help them achieve their goals. Visit http://habitatcabarrus.org/ or http://cabarrusrestore.org/restore to learn more about ways you can get involved.